The evolution of the coelom in animals marks the beginning of the specialization of many other systems. Without this level of development, essential life functions like circulation, respiration and excretion depend to a large extent on diffusion. The coelom, a muscle-lined body cavity, provides a chamber for blood vessels and a heart, complex digestive organs, excretory organs, and (in more advanced animals) organs for gas exchange. The diverse animals clustered together in the Higher Invertebrates unit all have coeloms. Two of the phyla of animals considered here evolved suits of natural armor called exoskeletons (exo- means outer), as opposed to endoskeletons. With the hardest part of their bodies on the outside, these animals have to wrestle with a balance between protection and movement. One such phylum is Mollusca, whose members, as we will see, found solutions in having reduced skeletons, or in being able to extend their bodies out of the skeletons (shells), only to withdraw for protection when danger appears. The other phylum, Arthropoda, are generally considered to be the most successful group of organisms in the world. They are very diverse, inhabit almost every environment on earth, collectively consume the widest range of nutrients, have numerous offspring, and are well-suited to defend themselves and escape predation. This biology study guide unit opens with a look at the earthworm and its closest relatives, followed by considerations of mollusks, echinoderms, and finally arthropods. Throughout this unit, the focus returns to the topic of system development and the structure and function of specialized organs. 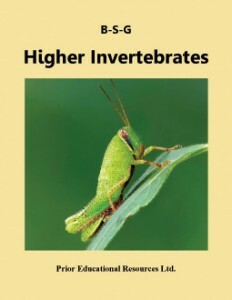 Higher Invertebrates is excerpted from our Biology 11 Study Guide, which is the fourth edition of a student study guide written to match the curriculum of British Columbia. The concepts presented are applicable to the biology curricula of other educational jurisdictions as well.